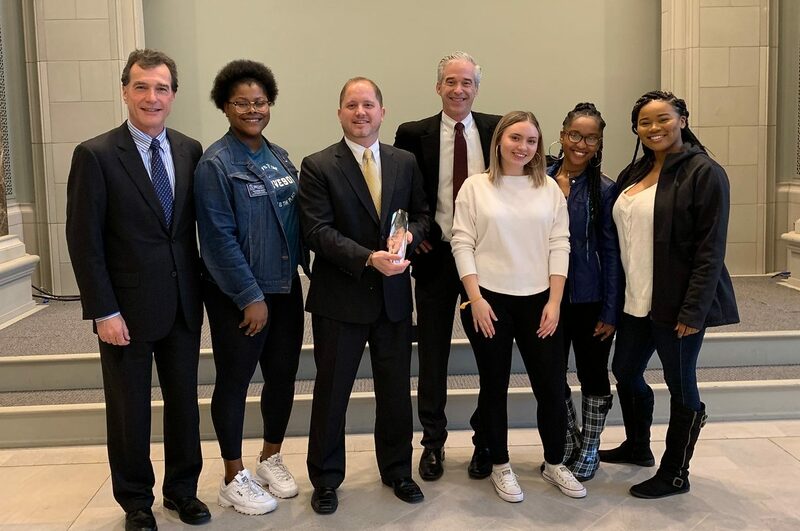 The Belmont University College of Law Champion for Justice Award was recently presented to a lawyer whose life’s work exemplifies Belmont’s mission to uphold Jesus as the Christ and the measure for all that we do. Clifford M. Nellis is the founder and executive director of the Lawndale Christian Legal Center. After completing his Juris Doctorate at the University of Chicago Law School and a federal clerkship, he decided to pedal his bicycle from Denver to San Diego to Miami before embarking on what could have been a very lucrative legal career. But on that trip, on which he took a Bible his brother had encouraged him to read, Nellis sensed a call to work with youth when he happened across a guard shack in front of a boys’ correctional facility in New Mexico. He began to pray for youth in juvenile correctional facilities and asked God to give him a vision for serving them. Eight years later, after crossing paths with Lawndale Christian Community Church located in one of Chicago’s toughest neighborhoods, Nellis helped found the Lawndale Christian Legal Center. He went on to earn a Master of Divinity degree to learn how to better integrate faith and justice. The Lawndale Christian Legal Center has grown to include 45 employees who not only offer direct services to thousands of youth and young adults, but also lead cross-sector partnerships between government and nonprofit leaders in Chicago and as far away as New Delhi, India. In addition, Nellis helped establish the first Restorative Justice Community Court for emerging adults in Chicago, and he has served as president of the Chicago Bar Association Legal Aid Council. This marked the fourth Champion for Justice Award presented by Belmont Law. Belmont presented its first Champion for Justice Award to the Rev. Fred Gray, a minister for six decades who also served as the attorney for Rosa Parks and Rev. Martin Luther King, Jr. The second Champion for Justice Award was given to Gary Haugen, the founder and president of International Justice Mission, the largest anti-human trafficking organization in the U.S. IJM lawyers and their co-workers around the world pray together daily as they work to free victims of human trafficking. The third Champion for Justice Award was presented to Bryan Stevenson, the founder and executive director of the Equal Justice Initiative. His team of lawyers works on prison and sentencing reform, with a focus on the death penalty and the mass incarceration of people of color. In addition, he was the founder of the nationally acclaimed Lynching Memorial and Museum in Montgomery, Alabama.